Friday morning I made myself a cup of solar cooked oatmeal and we hit the road for the three and a half hour drive to Bisbee. Why only one cup of oatmeal? Because it's the only food I know of that Martin will not eat under any circumstances. That, paired with the fact that we don't usually don't get up at the same time means at breakfast time it's every man for himself in our household. Bisbee is in Southeastern Arizona and if you ever get a chance to go there you're sure to have a good time. 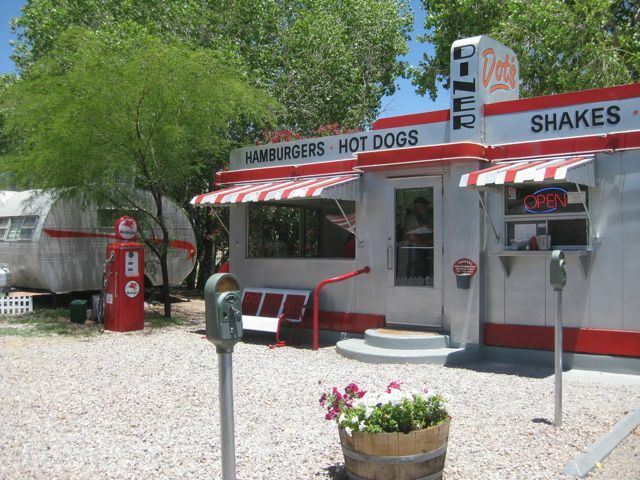 We got in at lunch time so we headed straight to Dot's Diner for a burger and sadly no pie. We wanted to stay in one of the Airstreams at the adjacent Shady Dell but they were sold out months in advance. Fortunately there are plenty of charming choices for accommodation in the area and we found a room at The Jonquil. 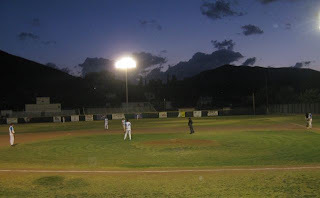 In the evening we watched the Bisbee Copper Kings play the Tucson Yard Dogs at Warren Ballpark, the oldest ballpark in the U.S. This is the third year I've attended the solar cook off in Bisbee, but the first time I've participated. It was here, two years ago that I first saw a Sun Oven and not long after I purchased one for myself. Once again I had two ovens with me, but since this was only a half day event I planned on making fewer dishes than at last month's potluck in Tucson. One oven was to be dedicated to baking. The second oven was for chicken and rice. Things did not go according to my plan. I got up early. Prepared the two pans of raspberry cookies, mixed the muffins, and after much debate, decided on the smaller black pot for the chicken and rice - my first mistake. Leaving the slightly larger cast iron dutch oven back at the hotel we headed out to the farmer's market where the solar cook off is held. While Martin set up the Sun Ovens, I spooned the muffin batter into the pan. Once they were in the oven I turned my attention to the chicken. Not wanting to bring a raw chicken all the way from Phoenix I'd bought one at the local grocery store. It was a lot more expensive than what I'm used to, but I just assumed that was because we were in a small town. When I tried to fit the darn thing in my smaller pot I realized it was a much bigger chicken than I normally buy, that explained the higher price, but there was no way I was going to get the chicken and the rice into one pot. Martin had to run back to the hotel to retrieve the dutch oven. I'd have to cook them separately and wouldn't be able to start the rice until I'd finished baking the muffins and the cookies. As Martin rushed off to the hotel, I headed back to check on the muffins. Only to find Valerie, the coordinator, trying to salvage what she could, my Sun Oven had blown over. Oh, that's right, I hadn't mentioned the 45 mph wind gusts. Not your ideal outdoor cooking weather. Somehow we managed to get the batter, or at least most of it, back in the muffin cups. Now I was even more behind schedule. 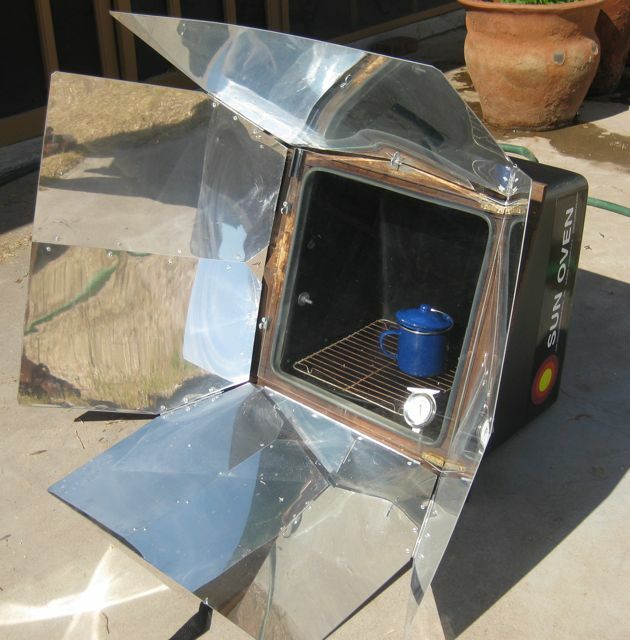 Wind is a much bigger factor in Bisbee than here in the Phoenix area and many of the local Sun Oven users have reinforced their ovens with bungee cords and now mine has been too. Miraculously the muffins came out o.k. even if they didn't look too pretty. As soon as they were ready I popped in the raspberry bar cookies. The wind still had not let up and was causing problems in more way than one. No one's oven was getting past 300º even with constant refocusing. The wind was kicking up so much dust that the sun rays could not get through in full force. My cookies were baking, but they were taking longer than usual. There was little chance the rice would be ready by 1 p.m. I tried anyway. I put the dutch oven with the rice in the Sun Oven around 11:30, but between the lower temperature and the heavy cast iron pot that takes longer to heat up it was nowhere near done by mealtime. At least the chicken came out o.k. Even with the wind and all the mishaps I had a wonderful time. The people were great and all the food was delicious. I'm already looking forward to next year. Sounds like a great day, nonetheless. We're a state (NC) with lots of wind, so I learned the bungee cord trick a long time ago. Lost a great pudding w/o one and decided to not take any more chances...gonna try to get a cook-off going here for Solar Cooking Day on August 1st. Haven't run into any other cooks, yet...thanks for sharing what seems to have been quite a day! This does sound fun. How do you find out about this events? Does someone have a calandar? Jim - I stumbled upon the Bisbee cook-off three years ago on a weekend trip. We enjoyed Bisbee so much that we go back every year at the same time for the cook-off and the baseball. I heard about the Tucson event through Paul Munsen of Sun Ovens International. I don't know of any calendar. I've found a few other events on google but they are all too far away. 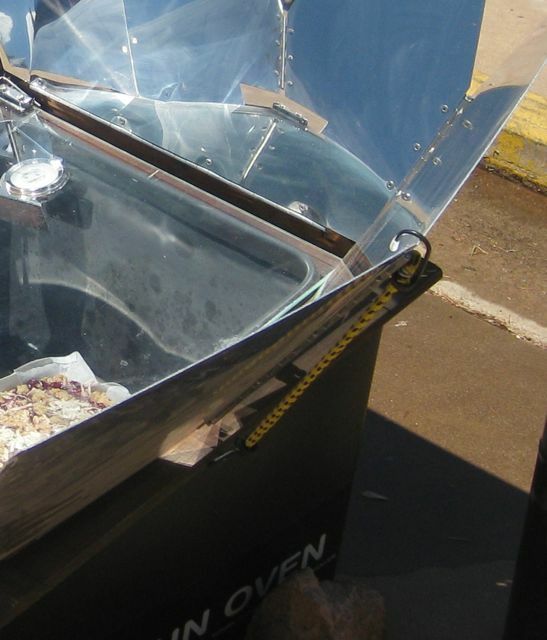 Most solar cooking events are very local. I was the one who had travelled the furthest to both of them. I think there used to be one in the Phoenix area, but can't for the life of me find any information about it. Get the best Yoga Classes at our Yoga Studio in London. You have posted nice and informative content, thanks for sharing.. This is a nice blog about solar cooking, I like this blog. Because you have shared ample on how you to cook chicken, rice and you backing cookies.and you spend wounder full time. We are providing Solar Charger and Solar Jacket you can visit this site and get more knowledge about this Solar charger.